Ivy Creek Family Farm grows vegetables, mushrooms, fruits, and flowers using sustainable practices. We utilize crop rotation, cover cropping, composting, and other organic methods to produce high quality, seasonal produce. 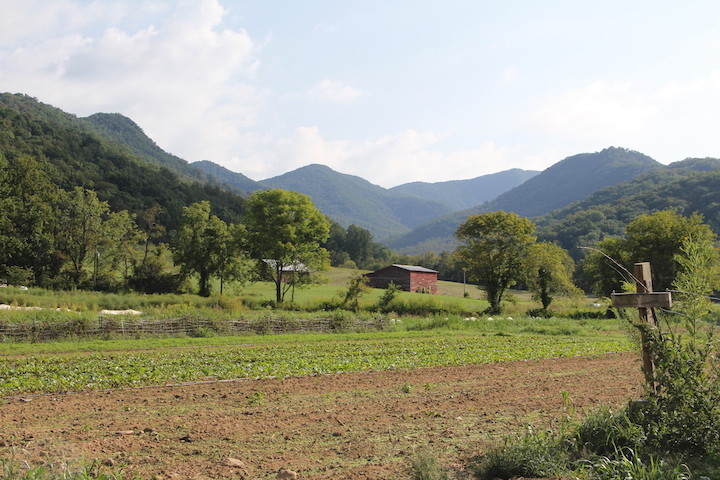 Our farm sits on the north fork of the Ivy River in Barnardsville, just 25 minutes north of Asheville. Find our produce, flowers, and mushrooms each week at the North Asheville Tailgate Market on Saturday mornings, the Weaverville Tailgate Market on Wednesday afternoons, and at our farm stand in Barnardsville seven days a week. Each year we sell 80 CSA shares and provide weekly boxes of Ivy Creek's best produce to members. We also sell our produce to area restaurants including Omni Grove Park, Curate, Nightbell, Plant, Glass Onion, All Souls, Sierra Nevada, and more. Interested in a CSA? Call us today! We offer free delivery of 8 shares or more to a single location. Try our spring carrots or summer tomatoes and you'll be hooked on local prodce for life! We grow delicious food all year long, from spinach and greens in the winter to over 50 varieties of veggies in the spring, summer, and fall. We build rich soils that produce quality vegetables. Our shiitake mushrooms are grown using traditional Japanese methodes. We put great care into every potato, carrot, strawberry and beet. You can truly taste the difference! Anna and Paul Littman own and operate Ivy Creek Family Farm. With their young children, the Littmans experience the miracles (and realities!) of growing plants and building community through food. Anna and Paul have been growing great produce at Ivy Creek since 2006. Paul’s formal training is in landscape architecture from Virgina Tech. Anna brings 15 years of nonprofit management and teaching experience to the farm. Hold your party, wedding, workshop, or retreat at the farm. We offer a 1600sq ft open air pavilion with a private bedroom, two bathrooms and a kitchen for events small and large. We offer our produce and flowers for farm events and can recommend wonderful local caterers, event planners, and musicians. Peak weekends book quickly. Contact us today!